May the $4.99 be with you (or something). 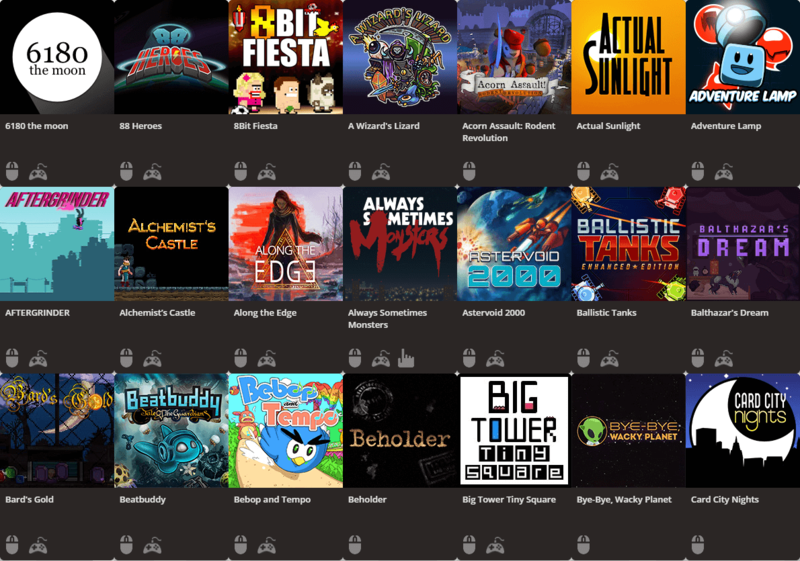 Yup, still that low a price per month for access to 100+ indie games, and… well, April’s become May, which means new games are being added! Now, as with April’s additions, May’s new games will be brought to the platform over the course of the month and as always, I will be updating with links (and video embeds), as each title becomes available on Jump. Tiny Pixel’s Boss Defiance is a three-to-four-player arcade/action competitive and asymmetric local multiplayer game. One player plays as the powerful Boss while the other players assume the roles of Heroes. The Boss must fight his way room by room, facing the other three players in various dungeon battle arenas. To win, the Boss has to reach the end of the dungeon, slaying all the Heroes in his/her way. The Heroes have to cooperate to stop the powerful Boss from reaching the end of the Dungeon. The game features Normal Mode and Beast Mode and can be played by three or four players. An extraordinary FPS throwback influenced by 90’s labyrinth style games, Mazes of Ogglar by Star Palm Games features traps, alien artifacts, liquid mirrors, lasers, and sentinels. You’ll need all of their persistence, stealth, memory, and nerves as you explore cyber-organic textures, strange crystals, forgotten fountains, and bizarre machinery. Assume the role of – Ikkarius, a young brave one from the bright galactic-melting star called Zaxxyn. Ikkarius has been chosen by the fearsome high judges, called The Bolgyys, to participate in a well-known deadly test in the Mazes of Ogglar, located at occult dimensions outside his home planet. If Ikkarius returns alive from the mazes, the elder judges will bestow him with the highest honor: integration into the legendary warrior tribe called Ethok. The Ethokians are rarely seen, but according to ancient lore, the brave team of warriors and dimensional explorers keep safe many planets and its occult spaces. Critically acclaimed and award-winning Baobabs Mausoleum Ep.1: Ovnifagos Don´t Eat Flamingos, by developer Celery Emblem, is set in the town of Flamingo’s Creek, a place that appears every 25 years on Albatross Road and a neighborhood that also only appears in nightmares. Follow FBI agent Watracio Walpurgis in his adventures trying to escape from this eerie village. Along the way, you’ll meet strange and paranoid inhabitants – not to mention cosmic laser chickens – while you wrack your brains trying to solve puzzles in the most hilarious and surreal situations. Your ultimate task is to defeat the Wendigo, all the while escaping from monsters out searching for UFOs to eat. Erica Reed’s investigation continues in Episode 2: The Wise Monkey by Phoenix Online Studios. When someone close to Erica is kidnapped by the Wise Monkey – a serial killer fixated on the gruesome mutilation of their victims – Erica is in a race against time to save his life. With the Wise Monkey case in her hands and the FBI’s resources already stretched thin, she’s on her own to find the killer before it’s too late – again.